A team of astronomers has discovered a galaxy – the first of its kind – that appears to contain virtually no dark matter. It is an exceptional find since galaxies are commonly thought to contain more dark matter than the ordinary matter that makes up a galaxy’s stars, gas and dust. Also, it is generally accepted that galaxies first formed from concentrations of dark matter that act like “galaxy starters.” They gravitationally attract ordinary, or baryonic, matter that eventually settles within the extant cloud of dark matter. Finding a galaxy with no dark matter raises the question: If the galaxy has no dark matter, how did it form? The paper appears in the March 29 issue of the journal Nature. The newly discovered galaxy is called NGC1052-DF2, or DF2 for short. In addition to the dearth of dark matter, DF2 is unusual in another way: It is roughly the size of our Milky Way Galaxy, but contains only 1/200 of the number of stars. It was first identified as a peculiar object using the Dragonfly Telescope Array, a groundbreaking instrument for detecting very faint astronomical objects, conceived of and built by van Dokkum and Abraham. Dragonfly is a multi-lens array that uses commercially available telephoto lenses with specially coated optical glass that reduces scattered light. Having grown from a three-lens array in 2013, it now has 48 lenses and is the world’s largest, all-refracting telescope. Previously, van Dokkum, Abraham and their collaborators used the array to discover a new class of galaxies known as Ultra-Diffuse Galaxies (UDG). Once the team identified the unusual nature of DF2, they conducted followup observations. From the W.M. Keck Observatory, they measured the velocity of clusters of stars (called globular clusters) within DF2 and found they were moving slower than expected. Using these velocities, they calculated the galaxy’s mass and determined that the visible stars, gas and dust in DF2 accounted for most of the mass and that there was only 1/400th the amount of dark matter expected. Followup observations with the Hubble Space Telescope revealed DF2’s other unusual qualities. Unlike typical spiral galaxies, DF2 has no dense, central region, nor spiral arms or a disk. And unlike elliptical galaxies, it has no central black hole. 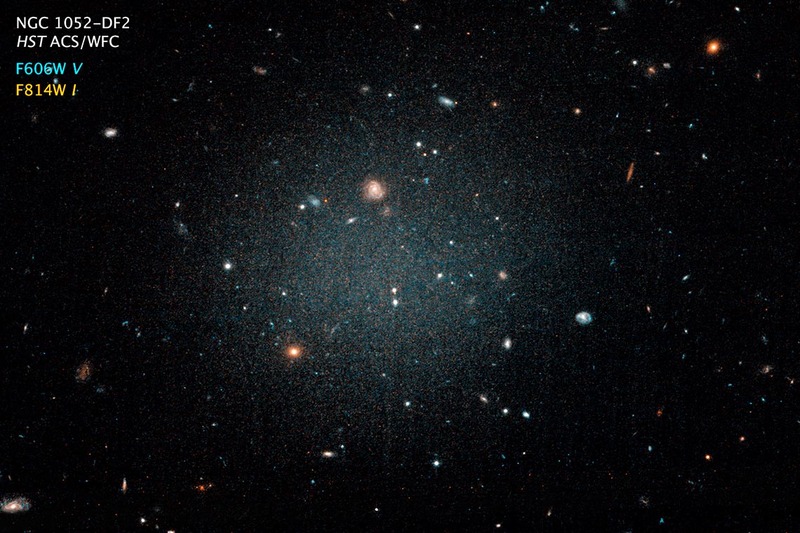 DF2 is located in a cluster of galaxies that is dominated by a giant elliptical galaxy designated NGC 1052. The astronomers speculate that the birth and formation of DF2 in the dynamic environment of the cluster could have been influenced by the giant galaxy. Or, a cataclysmic event within DF2 such as an eruption of star formation could have cleared the galaxy of all its gas and dark matter.